With AWS, we don’t have to purchase enough hardware to support our demand peaks and have much of it idle during our less busy periods. I would estimate we have saved HK$600,000 (US$77,350) by not having to acquire up to three physical servers. MyDress operates an e-commerce service that enables fashion labels in Japan, Korea, and Taiwan to sell clothes and accessories to customers in Hong Kong. The company also offers fashion labels a one-stop solution which includes website operations, product pricing and uploading, marketing, payment gateway, customer service, and logistic solutions. Founded in 2009, MyDress now has 35 employees and more than 200,000 members who place orders averaging HK$550 (US$70). In 2015, MyDress won a Bronze Award in the Best Lifestyle (Social, Communications and Media) category of the Hong Kong ICT Awards 2015. The service also won a special mention at the awards for its use of cloud computing. Fashion labels rely on MyDress to sell clothes and accessories to Internet shoppers in Hong Kong. To meet these requirements, MyDress needs to ensure that its websites and e-commerce services are available and responsive 24 hours a day, seven days a week. MyDress started operations with servers, storage, and related infrastructure in a collocated data center in Hong Kong. However, as MyDress became more popular, this infrastructure could not scale fast enough to support rising demand. The Magento e-commerce platform that powered its online stores was consuming considerable memory and processing power, and MyDress IT Manager Edman Hung feared that resource and bandwidth bottlenecks would compromise service quality and user experience. MyDress had to support its forecasted growth without a parallel increase in infrastructure costs. In addition, Hung needed to focus his lean technology team on adding value to the fast-growing organization, rather than “business as usual’” infrastructure maintenance and support. MyDress chose AWS based on recommendations from its business partners. These partners said that AWS service was easy to use, had the scalability to support growth, and was elastic enough to manage peaks and troughs in demand. MyDress also reviewed case studies of businesses running the Magento e-commerce platform in the AWS cloud, and it researched the range of services offered by the cloud provider. The business then conducted some limited stress testing before finalizing its decision to migrate the Magento platform and associated systems into AWS. The cloud provider’s simplicity and ease of use enabled the fashion e-commerce provider to complete the migration in weeks with no external assistance. MyDress is now running its e-commerce service and associated systems in the Amazon Asia-Pacific (Singapore) region, using Elastic Load Balancing to distribute incoming application traffic across multiple Amazon Elastic Compute Cloud (Amazon EC2) instances. Static images such as photos are retained in Amazon Simple Storage Service (Amazon S3). 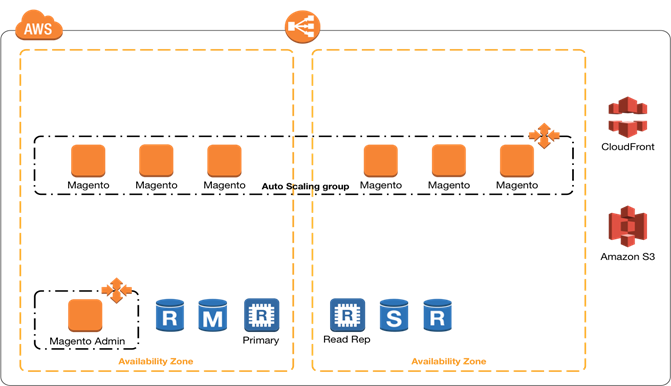 The MyDress Magento database in MySQL runs in Amazon Relational Database Service (Amazon RDS), with a subset of data moved to Amazon ElastiCache running a Redis caching engine to increase database capacity and improve application performance. AWS services are PCI DSS compliant, and the ability to deploy DDoS mitigation technologies provides MyDress the security features it needs. The business has shut down its infrastructure in the collocated data center and is currently running some development and testing servers at its headquarters. MyDress uses AWS Support, Basic-level, for locating information but has never called on the support team for assistance. The MyDress IT team is experienced in undertaking migrations as well as troubleshooting systems and architectures, so no training or AWS certifications were necessary. The MyDress Architecture on AWS. MyDress now has the scalability to support growth and the elasticity to manage demand peaks that can increase traffic by up to 100 percent. The service running on AWS is secure enough to minimize the risk of DDoS attacks compromising performance, and the AWS architecture eliminates the risk of bottlenecks compromising the user experience. Overall, the business has recorded about 99.99 percent availability since the move to AWS, assuring fashion designers and shoppers that MyDress will be available anytime, from any location with a web connection. “With AWS, we don’t have to purchase enough hardware to support our demand peaks and have much of it remaining idle during our less busy periods. I would estimate we have saved HK$600,000 (US$77,350) by not having to acquire up to three physical servers,” says Hung. MyDress can now operate without an administrator dedicated to managing servers and other physical hardware, enabling its technology team to focus on application development and other tasks that add value to the business. In addition, the ability to pay only for infrastructure resources consumed has enabled MyDress to reduce its operating expenditure by 20 percent a year over two years. “We are very satisfied with the AWS service. It has reduced our operating costs and enabled us in turn to provide a better service to customers,” concludes Hung. To learn more about how AWS can help you run your website, visit our Websites and Website Hosting details page.